Entries are out for the Senior PGA Professional Championship at Everett G&CC in Everett, WA. The event will be held Thursday – Friday, September 7-8. The entry deadline is Wednesday, August 23rd at 11:59 PM. The PGA of America changed to the entry process to a 5-year calculation which determined spots we are playing for and purse calculations. Professionals must be eligibly employed and classified in one of the following active membership classifications as of August 23 or have Life member status (LM, LMA, LMM, or LMMA) to be eligible to play in the Senior PGA Professional Championship Qualifier: MP, A-1, A-2, A-4, A-5, A-6, A-7, A-8, A-9, A-10, A-11, A-12, A-13, A-14, A-15, A-16, A-17, A-18, A-19, A-20, A-21, A-22, A-23, A-24. 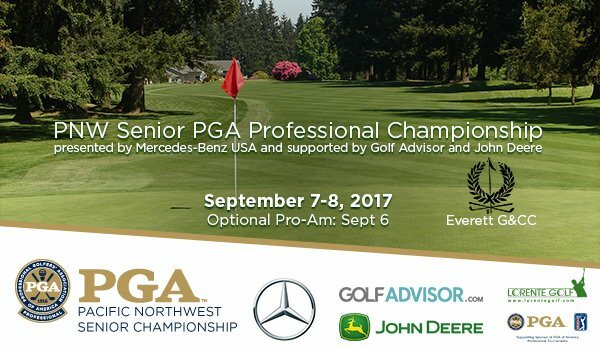 The top seven qualifiers from the PNW Senior PGA Professional Championship will advance directly to the 2017 Senior PGA Professional Championship presented by Mercedes-Benz USA and supported by Golf Advisor and John Deere. The National event will be played on Desert Mountain GC in Scottsdale, AZ September 28 – October 1, 2017. The top seven players who advance to the Senior PPC will receive a bonus payout of $300 each. Everett Golf and Country Club was founded in 1910 as a 9-hole facility that was designed by their local membership. In 1920, the late Ottar Thomle came up with a design for the second 9-holes. The facility has had some additions over the years from AV Macan and Ted Robinson. The golf course is an old northwest classic – short by modern standards; relatively hilly, smallish well-mounded greens with narrow fairways lined by stately Douglas Firs. Head PGA Professional Brent Webber is excited to host. The optional Pro-Am is returning on Wednesday. Please make sure to sign up on your Section entry form. If you want to sign up for PNW Senior PGA Professional Championship, please CLICK HERE for the PDF or enter online here. This SEPARATE (and additional) entry is for a chance to play for the purse and title of Senior PGA Champion. You will need to get BOTH entries in if you wish to qualify for the Senior PGA Professional National Championship AND our Section title! Last year, PGA Professional Rob Gibbons of Arrowhead GC won this event with PGA Professionals Joe Carranza of Aldarra Golf Club and Jeff Coston of Semiahmoo G&CC coming in third. The Senior PGA Professional Championship has Senior Hudson Cup points (worth 1.5 times the normal value) and Senior Player of the Year points! Plan on playing! The PGA of America has adopted the condition of competition for Grooves and/or Punch Marks at the Section level of the Pacific Northwest Senior PGA Professional Championship. ALL PLAYERS choosing to play in the Championship Division MUST comply with this condition of competition. This condition is in place for any senior who is playing the Championship Division regardless of whether they are trying to qualify for the Senior Professional National Championship – this condition does not apply to players choosing to play in the Senior Division.